Rare earth magnets are extremely powerful yet compact. 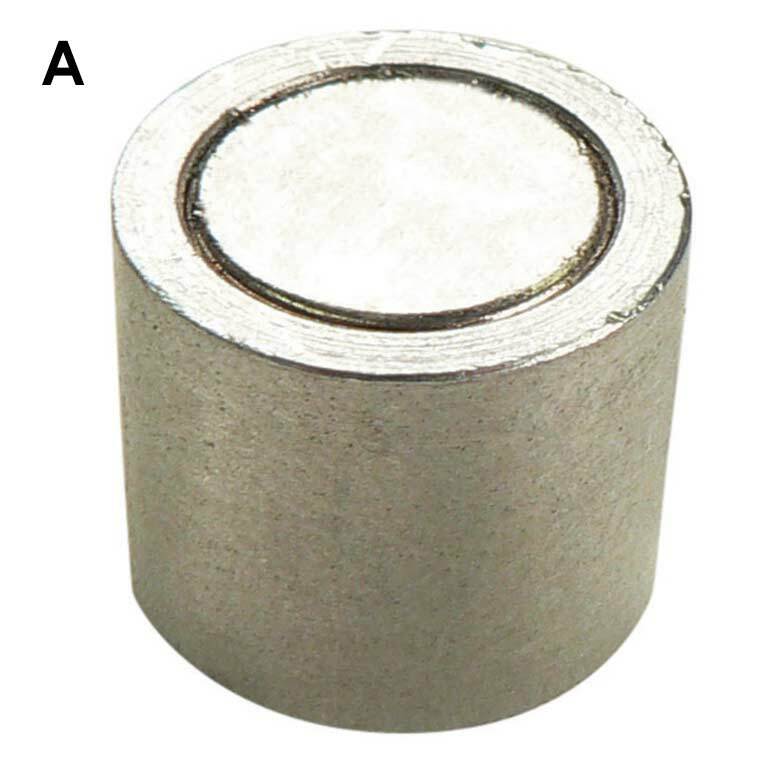 Alnico magnets are ideal for high heat applications and Ceramic magnet assemblies are generally the most economical. The magnetic assemblies below are available to order online, or contact us to order a custom design built specifically for your application. 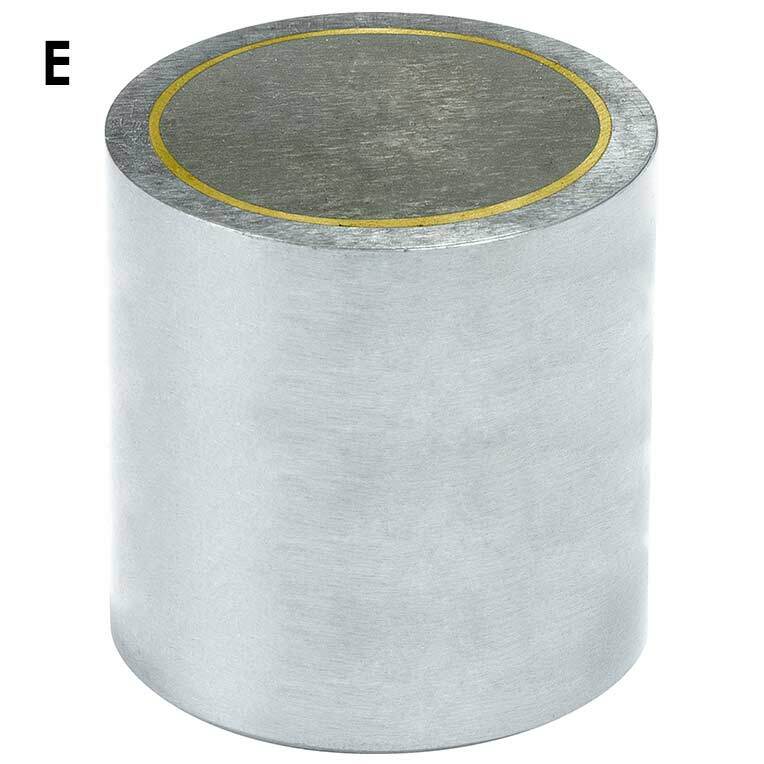 A: Rare Earth Neodymium 1-Pole magnet in an Aluminum insulated cup. 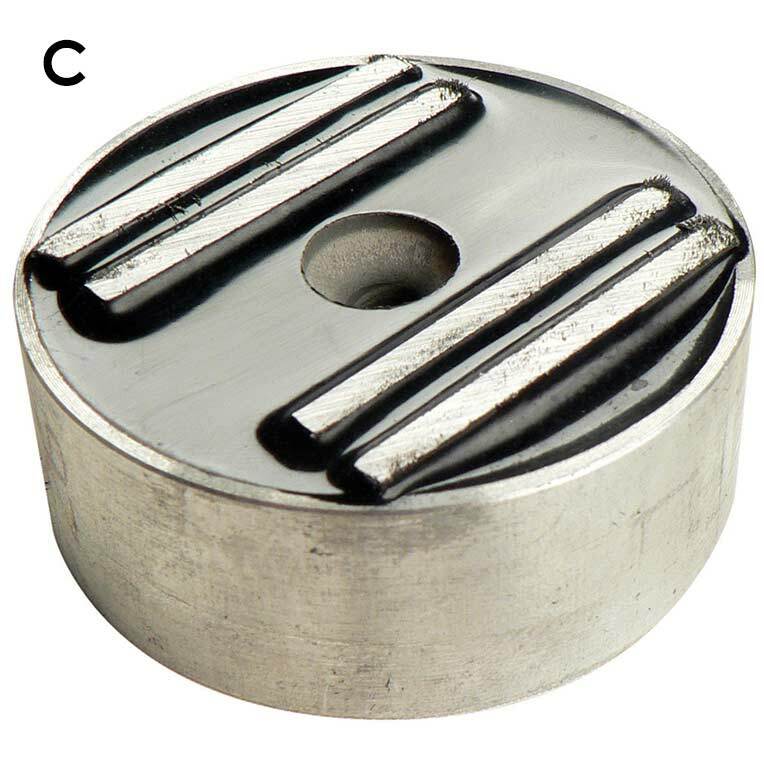 Powerful compact magnet that can be press fit or use tapped hole for mounting. +/- .003" diameter & .015" length. Maximum temperature 180°F (82°C). B: Rare Earth 3-Pole magnet in an Aluminum insulated cup. Extended poles can be lightly machined. Can be press fit or use tapped hole for mounting. +/- .003" diameter & .015" length. Maximum temperature 180°F (82°C). C: Rare Earth Neodymium 4-Pole magnet in an Aluminum insulated cup. Extended poles can be lightly machined. Can be press fit or use thru-hole for mounting. +/- .008" diameter & +/- .015" length. Maximum temperature 180°F (82°C). D: Rare Earth Neodymium 3-Pole magnet in an Aluminum insulated cup. Maximum strength in a wide but compact package. 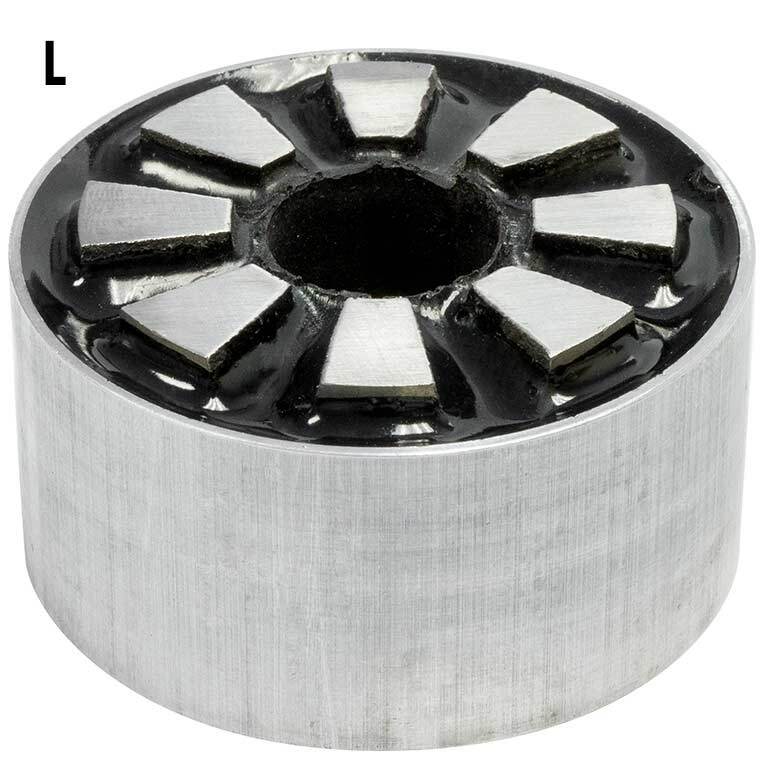 Can be press fit or use thru-holes for mounting. +/- .008" dia. & +/- .015" length. Maximum temperature 180°F (82°C). E: Rare Earth Neodymium Island 2-Pole magnet in a steel cup. Ideal for shallow fixtures. Can not be press fit without additional insulation. Use tapped hole for mounting. +/- .005" dia. & +/- .015" length. Maximum temperature 180°F (82°C). F: Rare Earth Neodymium parallel 2-Pole magnet in an Aluminum insulated cup. Flush face magnet, can be press fit or use tapped hole for mounting. +/- .008" diameter & +/- .015" length. Maximum temperature 180°F (82°C). 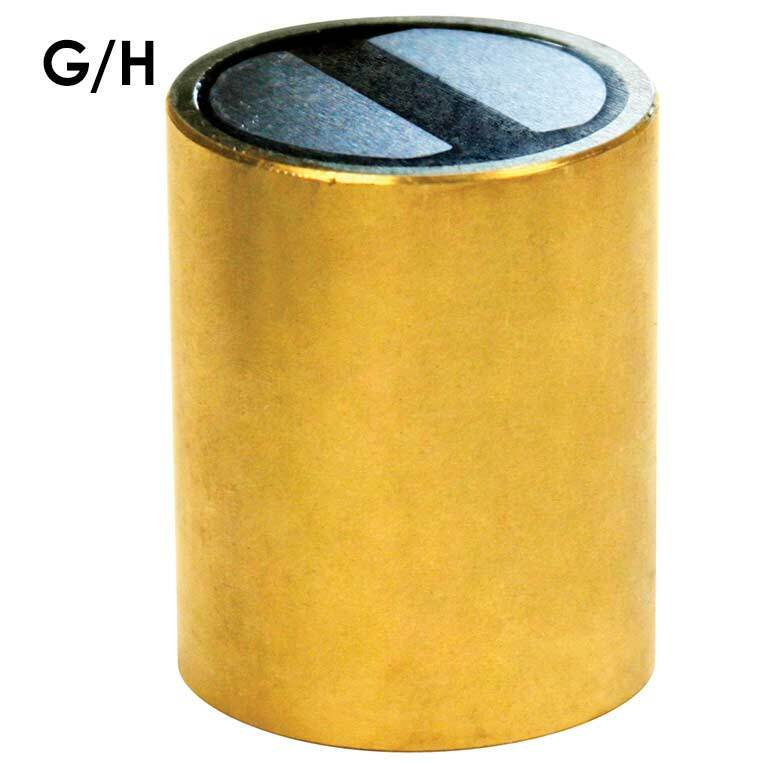 G: Rare Earth Neodymium parallel 2-Pole magnet in an Brass insulated cup. Ideal for metric press fit applications. +/- .002" diameter & length. Maximum temperature 180°F (82°C). H: Rare Earth Samarium Cobalt parallel 2-Pole magnet in an Brass insulated cup. Ideal for high heat metric press fit applications. +/- .002 diameter & length. Maximum temperature 392°F (200°C). 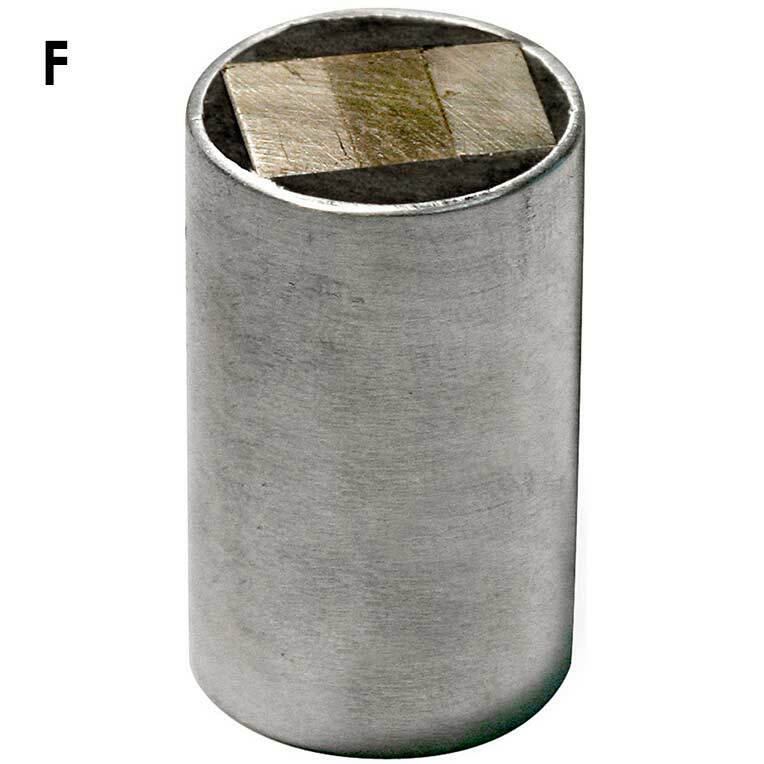 I: Alnico Island 2-Pole magnet in a steel cup. Especially effective in mold applications. Can not be press fit without additional insulation. Use tapped hole for mounting. +/- .005" diameter & +/- .015" length. Maximum temperature 800°F (427°C). 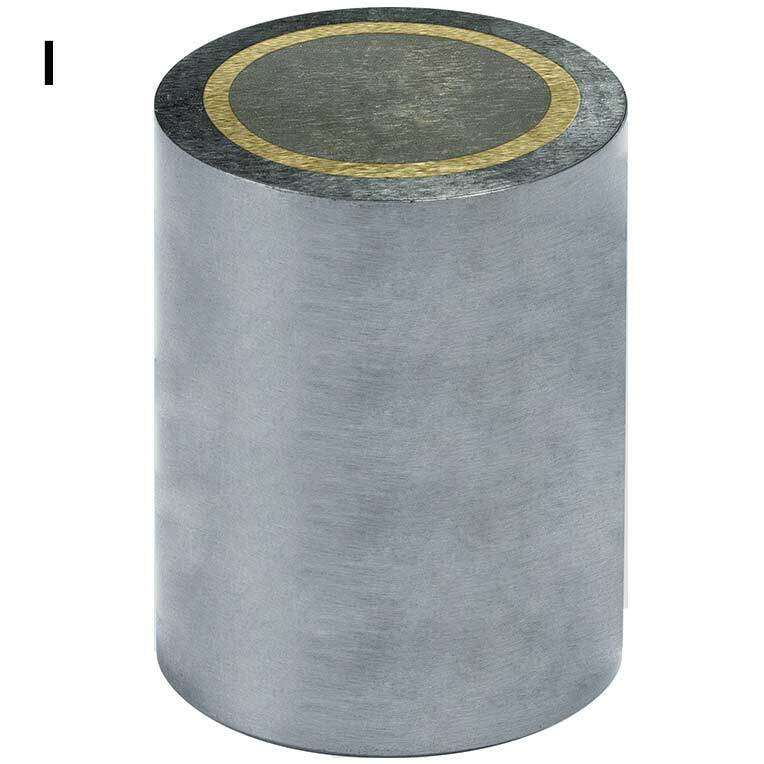 J: Alnico magnet material shielded in a brass sleeve, 1-Pole on each end. 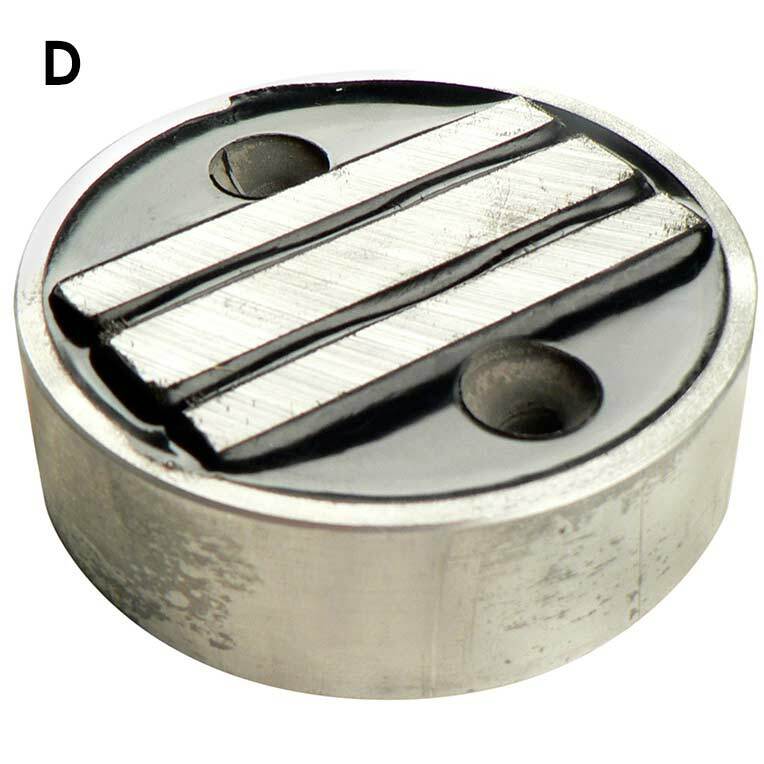 Insulator prevents loss of magnetic flux when inserted into steel components or fixtures. No mounting holes. +/-.001" diameter & +/- .005" length. Maximum temperature 800°F (427°C). 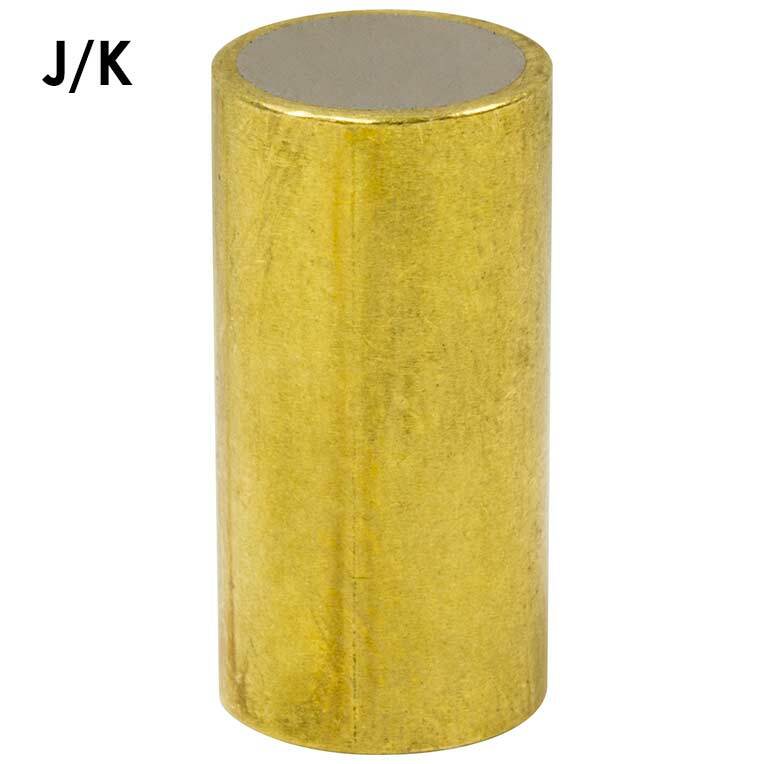 K: Rare Earth Neodymium magnet material shielded in a brass sleeve, 1-Pole on each end. 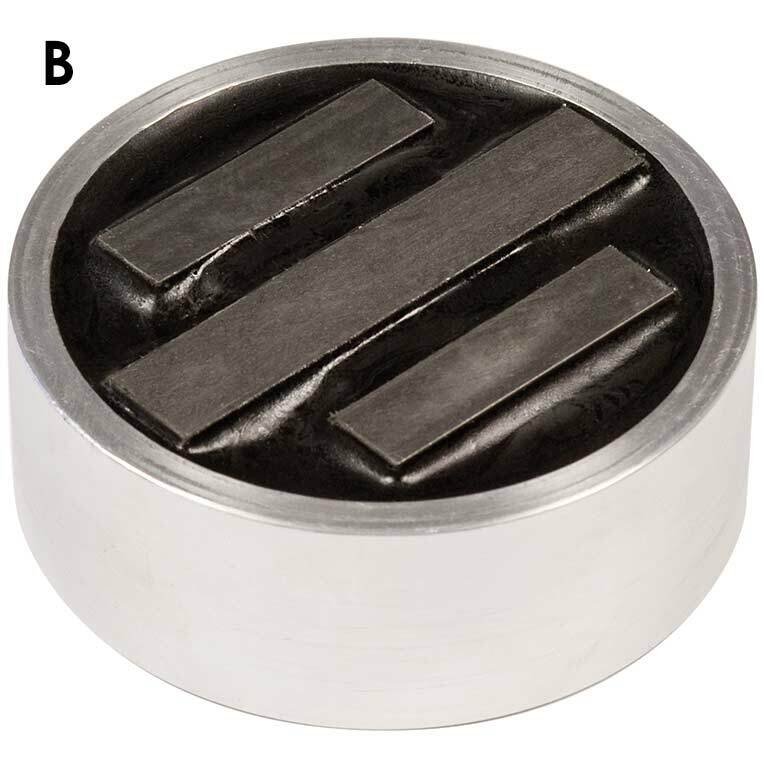 Insulator prevents loss of magnetic flux when inserted into steel components or fixtures. No mounting holes. +/- .001 diameter & +/- .005" length. Maximum temperature 180°F (82°C). L: Alnico Multi-Pole magnet in an Aluminum insulated cup. Especially effective on thin metal or difficult applications. Counter sunk mounting hole for easy installation. +/- .006" diameter & +/- .015" length. Maximum temperature 300°F (148°C). A N250T 1/4 1/2 .25 #6-32 1/4"
A N375T 3/8 1/2 1.30 #8-32 1/4"
A N500T 1/2 1/2 2.65 #10-24 1/4"
A N625T 5/8 1/2 4.35 #10-24 1/4"
A N750T 3/4 1/2 6.0 #10-24 1/4"
A N1000T 1 1/2 7.50 #1/4-20 1/4"